You may still be able to book by calling the hotel at 760-323-1711. Take the stress out of traveling with the family (or at least some of it) with a stay at the Holiday Inn Resort Palm Springs. From the extensive game room and sparkling pool found on the hotel’s grounds, to all the attractions and nightlife mere minutes away, you’re sure to find something to keep everyone occupied. Let your family’s future big leaguer run wild at Big League Field of Dreams or nurture those dreams of flight at the Palm Springs Air Museum. Engage in some retail therapy in downtown Palm Springs or commune with nature with a hike into the San Jacinto Mountains. When it comes time to settle down for the night, you’ll find guest rooms that boast pillow top mattresses topped with 280 thread count linens, plush terrycloth bath towels, 32-inch LCD TVs and complimentary high-speed Wi-Fi. While the stress of keeping everyone occupied may be taken care of, don’t be surprised if you have a hard time getting your family to leave. 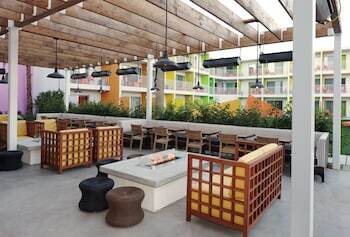 The Saguaro Palm Springs is a 4-star hotel located at 1800 E Palm Canyon Drive, Palm Springs, CA 92264, US . 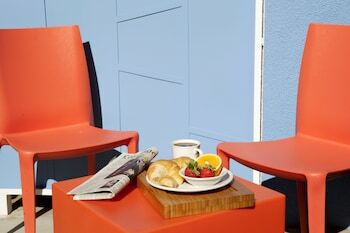 Its nightly price usually falls between $84 per night and $607.84 per night, excluding tax, depending on room category. 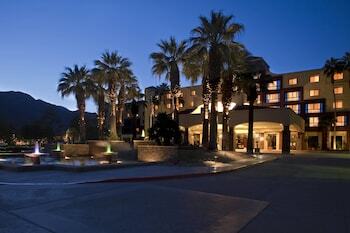 At The Saguaro Palm Springs, AAA members often get 7-13% off the regular rate. For example, on December 18, 2018, a AAA rate of $82 per night was offered - a 2.4% discount from the next-lowest rate. Depending on your itinerary, your savings can be more than the annual AAA membership fee itself! Many Room 77 users are able to pay for their entire AAA membership in a single stay. 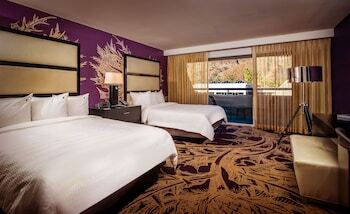 At The Saguaro Palm Springs, seniors often get 5-10% off the regular rate. For example, on December 18, 2018, a senior rate of $82 per night was offered - a 2.4% discount from the next-lowest rate. $84 per night found for a Signature Room, 1 King Bed room type. For December 18, 2018, a special AAA rate of $82 per night was found for the AAA-CAA - 1 King-Plush Beds-Robes-Refrigerator room type. For December 18, 2018, a special Senior rate of $82 per night was found for the AARP-Senior Rate - 1 King-Plush Beds-Robes-Refrigerator room type. 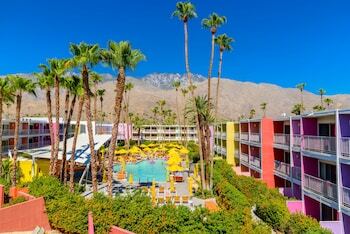 The Saguaro Palm Springs sells rooms through sites like Room 77, Expedia, Hotels.com, GetARoom, and many others. Room 77 searches across dozens of different sites to find the lowest discount rates available. The lowest rate we've seen over the last few weeks was found on Room 77. In 1% of the cases we surveyed, all sites offered the same rate. You can compare real-time rates from all of these sites on Room 77. Room 77 is the only hotel shopping site that includes special discounts like AAA, senior, government, military, and corporate rates.